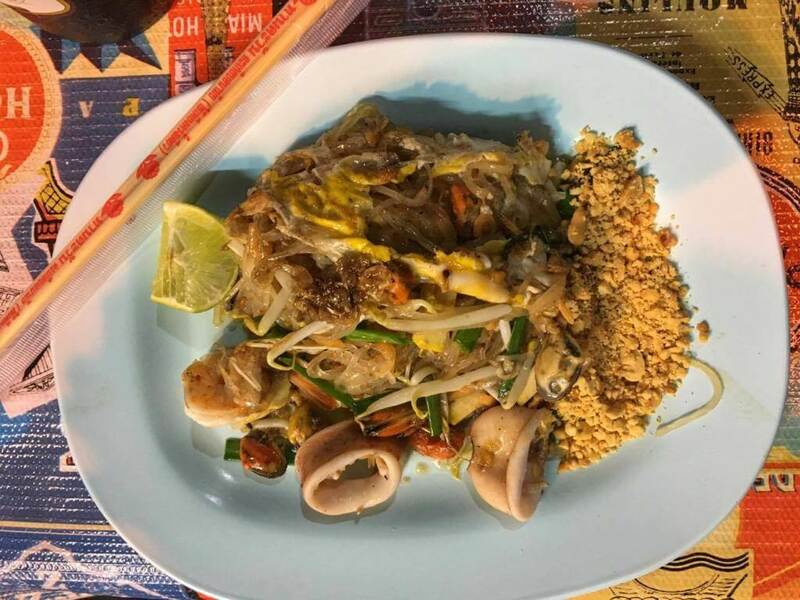 “Oh my God– that’s so cheap,” my new friend exclaimed as the vendor gave us the total and passed the pad thai dish she had just spent five minutes expertly preparing for us. While I’m also guilty of describing food this way, the more time I’ve spent on the road, the more the word “cheap” has begun to bother me. 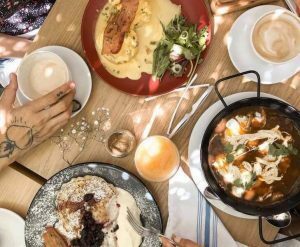 Yes, paying $1 for delicious, authentic local food can seem cheap, especially when, back home, you’re used to paying $8 or more for a lower-quality dish with the same name. But oftentimes, cheap denotes quality, not value. And what’s cheap for those of us who benefit from spending time in countries with weaker currencies than our own is often not cheap for locals. Imagine how a vendor feels when every third foreigner they serve calls their products cheap? How many times do they need to hear how cheap their food is before they decide they should raise their prices? And this brings me to the two-tiered pricing system. I often discover there are two sets of prices, one for locals, and another for foreigners. Sometimes it’s subtle. I’ll notice how much the local guy gets back in change and then realize I was given less for the same transaction. Other times, it’s not subtle at all. Museums and national parks may have two prices quoted on their entrance signs–one for foreigners and another for locals. 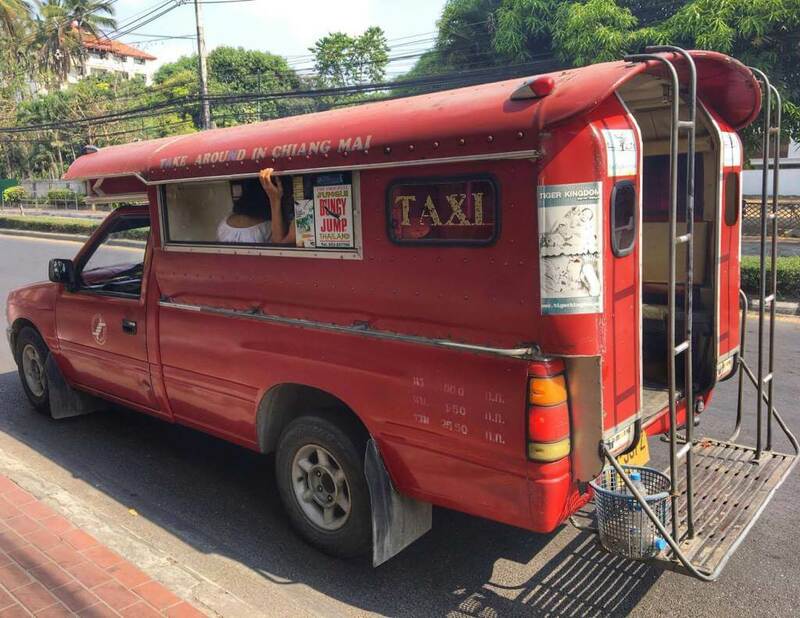 In Chiang Mai, Thailand, for example, a large network of red trucks work the city, serving as shared taxis. You flag one down that’s headed in the direction you want to go, hop in the back with others also headed in that general vicinity, and pay 20 baht (.55 USD) when you arrive. Oftentimes, when I flag down a red truck and tell him where I’m headed, the driver will quote me a price that can be as much as 10 times the normal one. “No, I live here. It’s 20 baht,” I say. Generally, they say okay and I jump in the back and go. They will rarely refuse to take you unless you pay more. How many times do you think drivers listened to foreigners gushing about how cheap it was before they decided they needed to raise their prices? This two tier system is something I’m still working on myself. To be honest, it’s taken a bit of reprogramming. I cannot imagine if we tried to institute the same system back home in the United States, where I’m from. People would call it racist or assume they were being profiled if they were asked to proof of citizenship in order to avoid paying more to receive the same. But in some ways I do understand the concept being that foreigners generally have more income and can afford the difference. But that’s too much of a blanket assumption. It doesn’t take into account all scenarios. Last summer, when I was in Lviv, Ukraine I remember constantly thinking about how cheap everything was. To me, it seemed phenomenally cheap. But then I learned that the average Lviv local person makes only $225 per month. 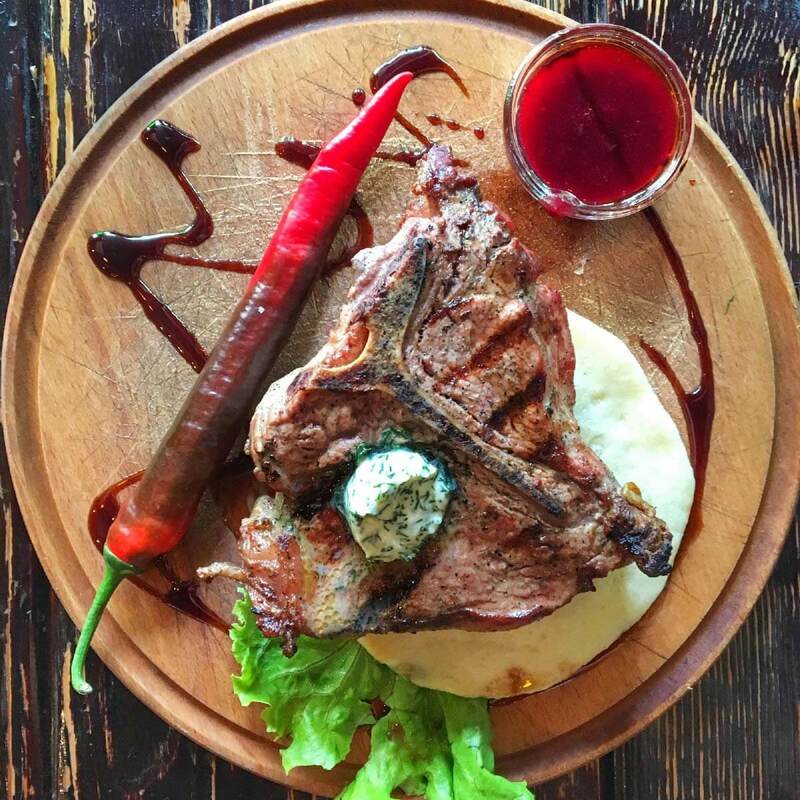 For many of them, this meal would be an absolute splurge. So how must the hardworking waiter feel when he brings this to the table only to hear diners remark about how “cheap” it is. Next time you’re tempted to call something cheap, instead try saying “what a good value” or something similar. There’s a big difference between getting a lot of value out of a purchase and that purchase being cheap. And as a bonus, it just sounds less offensive. What do you think– does this make sense or am I making too big a deal out of nothing? Let me know in the comments section below! Just my opinion but I think to call something cheap, at home or while travelling is a little condescending although I understand that most don’t mean it that way. It’s not even so much about how the person hearing it interprets the word cheap but that just because we are fortunate enough to have money for the necessities and luxuries like travel, not everyone does. It also takes away from our own experience of travel if we constantly compare it to something else rather than just experience and appreciate it. For sure– I agree! We need to recalibrate when we visit other areas and be mindful of the different standards. 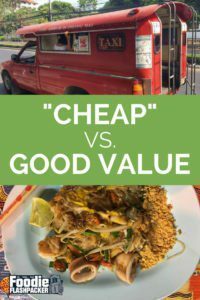 Yes I agree cheap is not the right word when you think about good quality and value, but it’s easy on everyone’s thoughts especially when someone adds it’s cheap but really tasty or good. I think verbal is different vs seeing this written down which needs to be explained completely. yes, for sure. It’s become so common for people to say that I don’t really feel people think about the meaning (intended or otherwise) when they say it. I must admit that I do this. I’ve also been in Ukraine and Thailand, and yes, the food is cheap there. 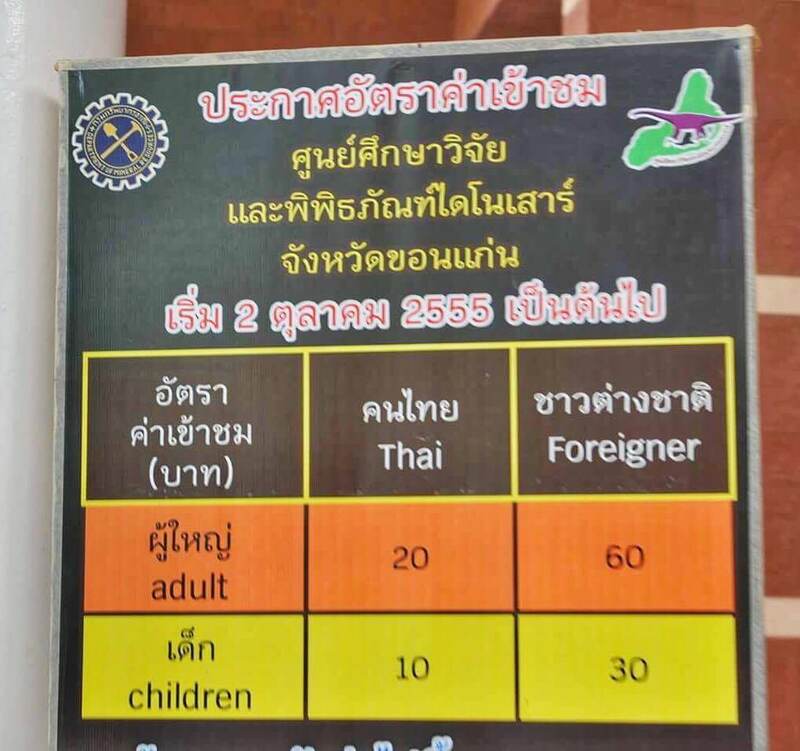 I’ve never thought that saying that would somehow be offensive but it’s true that it might make the local people think if they should increase the prices for foreigns. Yes, for sure. What’s cheap for us may not be so for others! ‘Cheap’ is a relative term. Live in Manhattan, then travel to Chicago and discover you’re ‘only’ paying $10 for2 hours of parking. Cheap! Or live in Miami and travel to a small city and wonder why your entree ‘only’ cost $15 instead of the usual $30. Cheap! I hadn’t thought about calling something cheap as being the reason for dual pricing, but it does make sense. Countries like Thailand and Egypt where it’s practically institutionalized have had their systems this way for decades. Yes, for sure– good point. Being from Oklahoma City everyone says it’s one of the cheapest places in the U.S. but once you’re living there and accustomed to those prices they’re normal to you, certainly not cheap. I’ve also been to Croatia and for everyone to say how “cheap” Eastern Europe is Croatia in peak season is far from being as affordable as surrounding countries. I prefer good value! What country are you from? I think affordable is a better word for cheap. But as you said, price and how you value things is circumstantial. To most Westerners, everything in Southeast Asia is cheap. I do agree that announcing that to everyone, especially when it comes to food may seem offensive to some. Yes, I agree– I think affordable or good value are better descriptors. I completely agree with this. It must be horrible to have food you’ve prepared so lovingly called cheap. It may be cheaper than home but that still doesn’t mean it’s cheap for the area. It also might encourage them to raise their prices which the locals would hate! Yes, for sure! You can hardly blame anyone for raising the prices if they’re constantly hearing how cheap it is! I know if I owned a business and everyone came in telling me how cheap my products were I’d be tempted to raise the prices! NO! I don’t like that at all lol. I feel they should establish what is a fair price and charge everyone that price. But, living in London I can see how that might be tempting for you. The only way I would like that is if they offered a better prices to guests lol. Like- we know you spent all the money on a plane ticket, hotel, etc etc– here’s a break on admission to the museum. Nope, you’re not making a big deal of something. You’ve made an excellent point. We forget that words have several connotations. I also dislike the different pricing for locals and tourists/foreigners as well. I hate dual pricing even though part of me understands it. But, it’s just something I’m not accustomed to. Part of living/traveling abroad! You are right, cheap may be misinterpreted as being in terms of quality rather than in price. However what one needs to look at is value for money. Yes we should stop calling things cheap just because they cost less, it is an insult to them as the quality is by no means compromised. yes, I agree! And also if people hear us constantly saying this they may begin charging more. I couldn’t agree with you more! It’s the wrong word. I think we’ve all been guilty at one time or another of saying it, but hopefully like you we’ll all stop. Great points. I’m still a work in progress on this one. I think sometimes my knee jerk reaction is to call something cheap but I’m trying to reprogram myself. You are making a good point that word “cheap” may sound as an insult, especially for something hand made. As of the dual pricing – I find it irritating sometimes, but I try to look at it as a way to help a country I liked to grow and develop by investing a bit of money in it. Yeah, for sure. I get it but it’s still so frustrating. I just can’t imagine if we tried to initiate it in my home country of the US. People would feel discriminated against! I’ve thought this so many times before too – and it’s so true that you could easily be offending someone while saying it. Imagine saving up for months to buy a car and then having a wealthy person be like, OMG! That’s CRAZY cheap!!! – It’s rude. “What good value” is a much better suggestion. Yes, exactly! Your feelings might be so hurt! Nathan I totally agree with you. We do compare prices when we travel, but we appreciate and are thankful that we can get an item, whether it is food or a piece of art or a souvenir for a better price than at home. Yes, for sure! I appreciate it as well and sometimes you’re astonished at the price difference. I just hope to never accidentally offend anyone in the process! You raise a good point. I traveled to Indonesia last year and I noticed that many attractions have 2 tier pricing system as well. We should stop using “cheap” and say “great value” instead! Yeah, the two tier pricing system is in full effect in Bali! I noticed it a lot there as well. I definitely agree with your points. I expect I’ve been guilty of this in the past but now I’m a lot more conscious of what I say. I wouldn’t like it if someone referred to my products as cheap either. Although I also dislike the foreigner/local pricing I can understand why some countries do it – I just hope they put the fee to good use! Yeah, for sure! I hope if they’re charging us more they’re reinvesting the money back into maintenance or better preserving the site so it’s around for others to enjoy later. It’s so true – what might seem “cheap” to you could be quite expensive for someone else. It’s all relative. Pricing can even vary in Canada (where I’m from) when you drive an hour down the road from big city to small town! Haha. I never thought about it that way. But I’m definately guilty of calling something cheap as in price and/or in quality. When referring to the cost I would hate it if a local thought I was referring to their food as cheap.. I wonder if an arguement can be made going the other way. Referring to something as too much, might mean that the amount of work that was put into something might not be worth it. This may also insult a local. I remember doing that too. Not because of quality but because of price. Yeah, in Iceland I was in constant shock with how much things cost. I don’t know if I ever said anything in front of the person selling it but I had a lot to say about it when I finished the trip and people asked how the country was. This was a great post, I shared it on my facebook page. It’s something I haven’t thought about before. I like how you worded it in a way where it wasn’t condescending, but firm enough to make me think! To be honest, I would probably blurt something like that out just out of sheer amazement and not realize the impact. So thank you for this. Francesca @onegrloneworld recently posted…7 Easy Ways to Afford Study Abroad – Even If You’re Broke! Thank you for the share! I appreciate it. I’m glad you felt I wasn’t condescending– I really tried to steer clear of that. And I didn’t want it to come off as me ranting about a pet peeve, because I think pet peeves are a bit silly themselves, but I guess that’s an entirely different blog post! I wanted people to think about impact when we say this! Me too! It happens so much to me living here in Thailand. Sometimes, what people don’t understand though is the big picture. You might make a bit more off of me one time but if I notice it I won’t return whereas a business that is consistently fair with me I’ll always return to and recommend to others! Those are some excellent points! Some things in Puerto Vallarta, Mexico seem really “cheap” to us but to the people that make 300 pesos a day, it’s an entire paycheck! Yeah, for sure! Especially in places like India where things seem such a good value for some of us but absolute luxuries to others! 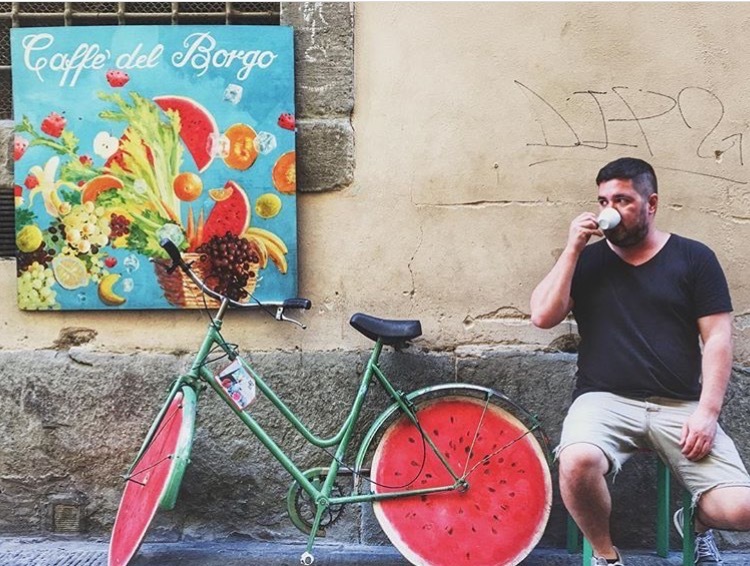 Hey Nathan–one thing that always impresses me is when a traveler is on the road enough to analyze aspects of travel that most people don’t think of. After reading your missive above, I started recalling all the times I’ve been on the road and said something was cheap—and now wondering what the effect was. Yes, you might well be overthinking this, but sometimes it’s worse in life to underthink things, and bringing a topic up for discussion, even if it’s summarily dismissed, is not a bad thing. Thanks, Tom! It’s a habit of mine that I’m still trying to break as well. I think so often it can speak to quality rather than value. I know most people don’t mean it offensive when they say it but we also have to think about perception and influence. I ve never thought about that! I agree about how offensive that sound, even though is a perspective of a differente culture. Im from Brazil, I think our coin is consider cheap for Americans and Europeans but is well known that the our biggest touristic cities are way overprice because of them. I dont know how cheap it is for a foreigner afterall. For a regular brazilian is very expensive.